Lately, I have really been into making stirfry dishes IF they include noodles. And sometimes, I just add noodles and adapt a dish! 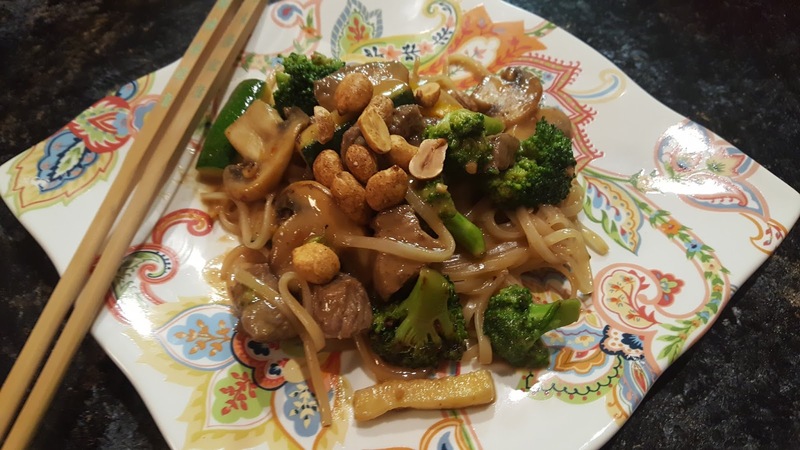 I love that stirfry "recipes" are really just a guideline - you can use whatever meat and vegetables you like and have on-hand, especially if the sauce is versatile. 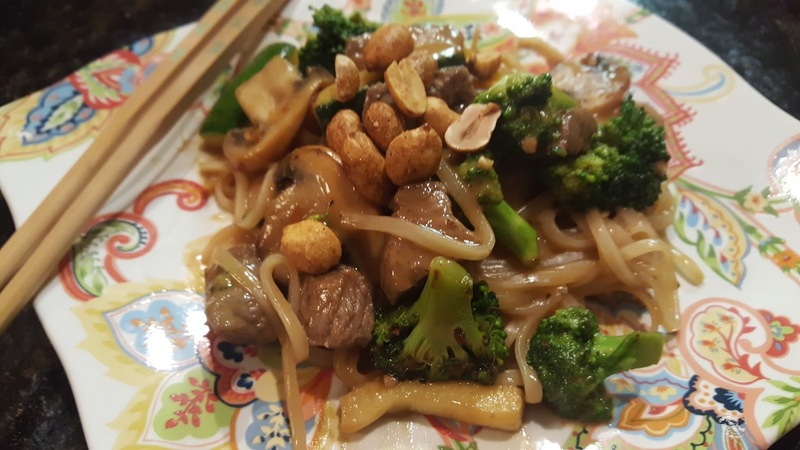 For me, peanut sauce works well with chicken, steak and pork - not so well with fish - but that's just a matter of preference! 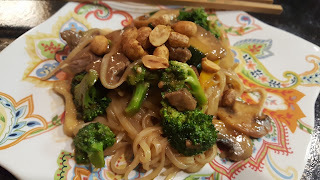 For this version, I used up some leftovers which included steak, broccoli, zucchini and mushrooms. Carrots, peppers, asparagus etc would all be delicious additions as well. Consider this recipe your template, and then make it your own. Find more great ideas at Inspiration Monday, Inspire Me, Inspire Me 2, Busy Monday, Fabulous, Show and Share, Wow Me, Wow Us, Whisk It, Hearth and Soul. Cook pasta in a large pot of salted water according to package directions. Drain and return to pot. Toss with 1 tsp. sesame oil. Meanwhile, heat 1 Tbsp. sesame oil in a large skillet over medium high heat. Add steak and cook, for 3 minutes or until browned on all sides. Remove to a plate. Heat remaining sesame oil over medium-high heat. Add green onions, peppers, broccoli, zucchini, garlic and ginger. Saute until vegetables soften, about 4 minutes. In a large measuring cup (2 cup capacity, or a small bowl) combine honey, peanut butter, soy sauce, vinegar and chili-garlic sauce and whisk well. You may want to microwave for 30 seconds to make the peanut butter easier to stir. Add to the vegetables, and add the steak back to the skillet. Simmer sauce 2 minutes. Add noodles to the skillet and toss well. Transfer to platter and serve warm. Garnish with additional green onions and chopped peanuts, if desired. I agree, Sara, Peanut Sauce is nicer with meat than fish - and I love your recipe for Thai Noodles with Peanut Sauce! Thank you so much for sharing it with the Hearth and Soul Link Party!